This is the story of the end of the world and its rebirth. Some worlds are destined to die in fire, some in ice. A few worlds last until their sun or their resources are exhausted. This world’s end was caused by something quite different. Although the source of destruction was unusual in the grand scheme of things, the outcome was clear: near extinction for the creatures living on the surface. 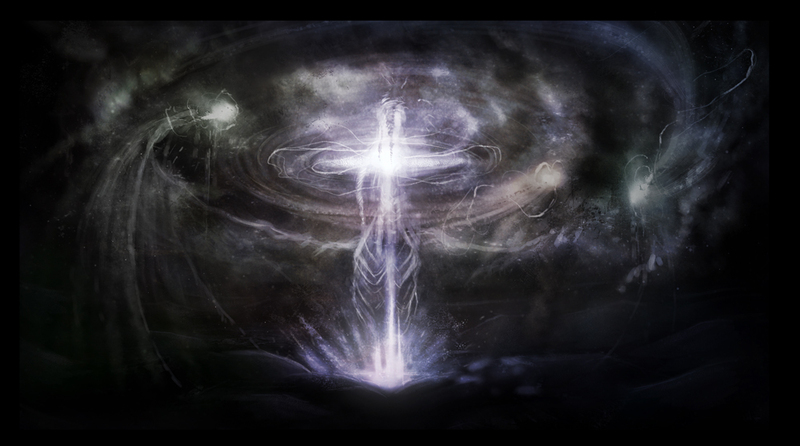 The Piercing of the Veil (a living barrier that separates our dimension from others) caused massive amounts of raw power and strange entities to flood into this world. Veilstorms, seismic upheaval, death, and ruin followed. Most of the world’s flora and fauna was either changed by this initial surge of power or simply wiped out. The ice caps melted, the seas rose and fell and rose again, as dramatic changes took place on the ocean floor. Great fissures opened up, and the oceans drained to somewhere deep within the world. Massive volcanoes erupted in the water, forming new islands as their magma, dust, and ash spewed upward. The continents, where living things had walked and crawled upon the world for eons, changed forever. Mountains collapsed into great sinkholes, and the land tore itself to pieces. Even the mighty heavens above were changed, as the moon suddenly found itself with a companion; a new moon that crashed cataclysmically into it, sending both moons in new orbits around the planet. Month after month, year after year, this world was swept by an ever-changing flood of new disasters. As the power poured into the world, many strange creatures made their appearance. Creatures that had never been seen upon this world now walked, crawled, or even soared above it. Things that had long ago passed into legend made a triumphal return, whether they were welcomed or not by the world’s beleaguered inhabitants. 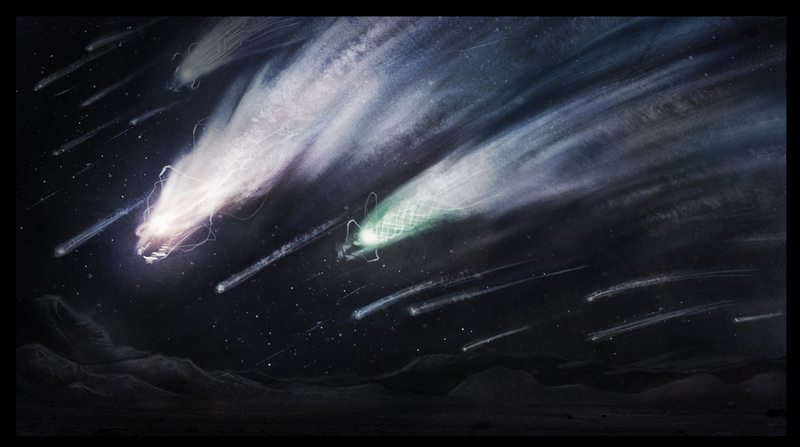 Just when it seemed that all was completely lost, the first sign of amazing changes yet to come was seen in the skies. On a small island, which floated in an ocean whose name no longer mattered, a few survivors watched a new comet appear. To those standing in the open air that night, it seemed no different from any of the other comets that now seemed drawn to this world. However, the people with the sharpest eyes could discern that the comet was shaped more like a disc, cloaked in a whirlwind of three colors all spinning together furiously. The “comet” did something that comets were not supposed to do: As the mysterious object neared the planet’s atmosphere, it slowed down to a stop. The disc split into three separate and smaller comets, each holding one of the three colors. These new comets slowly began to circle the world. For seven days and nights they continued moving around the planet, brightly colored tails whipping as if in a great wind. Had the inhabitants of this world possessed the means to penetrate the darkness of space, they would have seen that the original comet had emerged from the great rip in reality created by the Piercing, the same opening in the very fabric of our dimension through which the terrible power had passed. This gash appeared as a giant swath of blackness, somehow darker than the empty space in the nighttime sky. It absorbed light that passed into it like a dry sponge in water. Some say the rupture in the Veil had a distinctive shape, but most of the survivors didn’t care. They were too focused on surviving to notice such a trivial detail in the sky. Little did they know this split in their reality would lead the world in an unimaginable direction. Unimaginable, that is, except to the dreamers, the madmen, the weavers of stories about worlds and people beyond their own. After a week had passed, the three comets began spinning again, and moved faster in their orbit around the world, building up enormous speed. This attracted the attention of many survivors; the movement of the glowing comets created a spectacular light show in the nighttime sky. Trails of color filled the heavens, and fell like silent rain. Though some searched, nobody could find any trace of what had seemed to fall to the ground. After another seven days, the comets did something else unexpected: instead of leaving the planet’s orbit, they crashed into each other. The world exploded with color as the enigmatic objects fused back together. The night sky glowed, and the world’s survivors looked up with hope and awe, transfixed by the sight. For a moment, they forgot the horror of their daily existence. And then, as quickly it had brightened the sky, the fusion became complete. The light and color vanished, sucked into the restored comet. Slowly, the comet left the dizzying heights and moved slowly downward through the sky, heading for landfall somewhere on the planet. However, after a short descent, it seemed to find its place, hovering motionless for days and nights on end. However, while its position in the sky may have been constant, the object’s effect on the world’s people was not. Many looked to the glowing disc as a sign that the world would be saved, while others thought it a harbinger of worse things yet to come. Both camps, as it turned out, were right. After a few days, the disc began to spin again. This time, the colors emitted from the cosmic lightshow were directed downward, to a hidden spot in one of the few habitable areas left in the world. The light of the object was extremely bright, and it could be seen from a great distance, even from deep in the void of space. When the light touched the ground, its brilliant shape began to change, expanding outward in a swirling funnel of shimmering color, something like an upside-down tornado. Though it looked like a shaft of light, the column was found to be quite different by the few brave survivors who dared approach. It was like touching a solid wall. Nor could they see inside the whirlwind of light, for it was opaque. Though the glow hurt their eyes, oddly enough these brave ones said the mystery was as impenetrable as the deepest and darkest depths below the world. 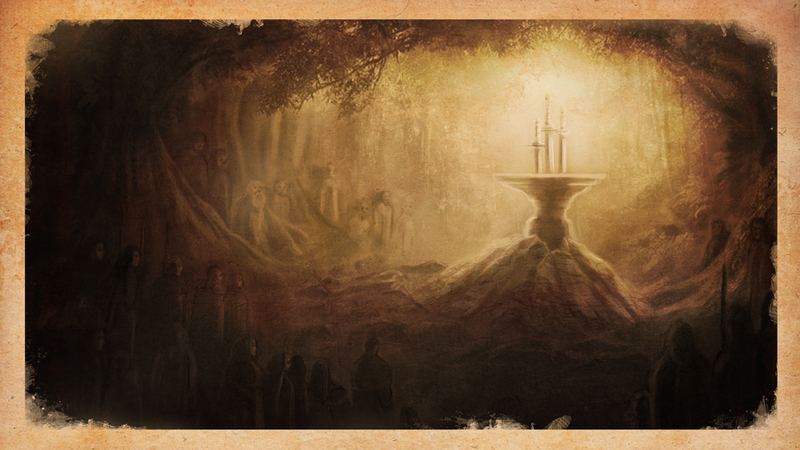 Folk were drawn to this strange phenomenon, and they gathered around it. Some of them were still Human; others had been changed by the Veilstorms into something else. For many of them, this was the first time they knew that others had survived the apocalypse, or as they began to call it, the Breaking of the World. Though many of them had changed, the survivors were filled with a small bit of hope: they believed this strange light was a sign from the heavens that the cataclysms were over. Their belief gained credence as they realized that since the comets spun around the world, the worst of the Veilstorms, already called Malevolences, had not reappeared. While the people of the world could still feel the terrible pressure in the air that preceded these storms, no actual Malevolences had been seen in this land or others since the comet’s appearance. For fourteen more days, the light shone on unchanging from the strange object. Then, on the fourteenth night, something did change: The light became even brighter, and separated into its three colors. As night turned to day, the mysterious light changed again: it disappeared entirely, although the object in the sky stayed eerily motionless. Something was different about the ground below. Where the beam of light had touched the surface of the earth, there now sat a great metal anvil. Embedded in the anvil were three mighty swords. Thus ends Part One of the Coming of the Emissaries.